Drago is the sixth boss that Toad faces in Game B of the Round Mode in the Nintendo Entertainment System version of the game Wario's Woods. He appears in the fifty-ninth round and has 16 hit points. 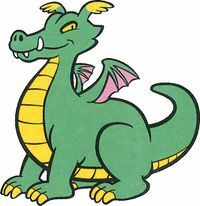 Drago is depicted as being a somewhat large, smug, green Dragon. Drago has a special attack that involves him turning red and spurting fire, turning all on-screen bombs into more enemies. Like the other bosses, Drago can also re-locate himself to different positions of the stage to avoid Toad's attacks and be able to throw enemies around. If he re-materializes on Toad, Drago instantly knocks him out. Drago also appears in volume 13 of Super Mario-Kun. Wario apparently awakens it by attaching a tube through it and activating a helmet. Drago is later seen ambushing Mario, Luigi, Yoshi, Toad, and Wanda, starting a battle. Wario, meanwhile, watches the scene through a screen. In the end, though, Birdo arrives, and Drago falls in love with her, ending the battle. This page was last edited on January 30, 2019, at 19:35.